When an area event has been around for more than two decades, it definitely moves from the “annual event” category to the “Chester County tradition” category. The Kennett Brewfest has reached that plateau. 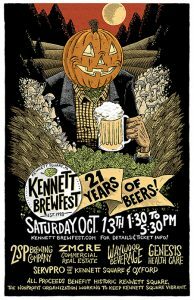 The Kennett Brewfest, which will be held on October 14 in downtown Kennett Square, is celebrating its 21st anniversary this year. 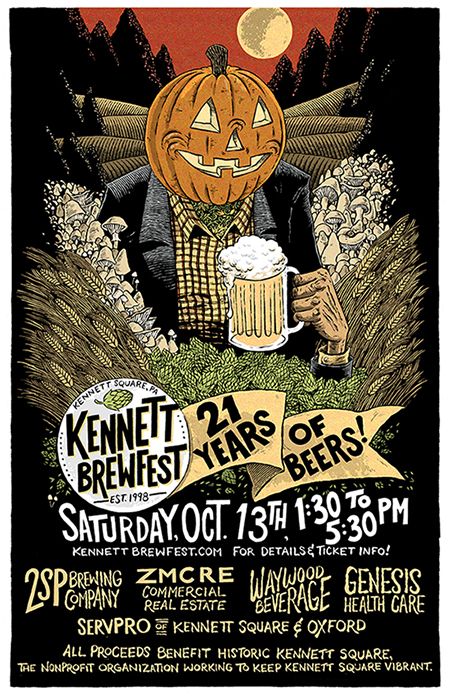 Scheduled to run from noon-5:30 p.m., the Kennett Brewfest provides visitors with the opportunity to sample some of the best regional and national craft beers accompanied by great food, great music, and a lively crowd. Participants can enjoy samples from more than 100 local, regional and national breweries. All attendees have access to food and merchandise vendors, live bands, sponsor tables, and more during the entire event. Doors open at noon for the “Connoisseur Tasting” and the regular fest begins at 1:30 pm. All taps will close at 5:30 p.m. Some of the participating breweries are Downingtown’s Victory Brewing Co., Zero Day Brewing Co., Transmitter Brewing, Great Lakes Brewing Co., 2SP Brewing Co., Locust Lane Craft Brewery, SlyFlox Brewing Co., St. Boniface Brewing, Sterling Pig Brewery, and Hollow Earth Brewing Co. The food truck court will feature 2 Fat Guys, State Street Pizza, Dia Doce Cupcakes, George and Sons’ Seafood, Natalie’s Fine Foods, Primo’s Hoagies, The Polish Connection, Ka’Chi Food Truck and Talula’s Table. Live music will be provided by The Sin City Band and Carl Filipiak & the Jimi Jazz Band. Tickets will be scanned at the entrance, where participants will receive their tasting cups. No one under the age of 21 will be admitted. Tickets are $50. 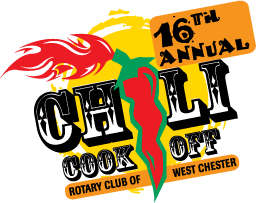 On October 14, West Chester will be the site of a special event to determine who can make “The Best Darn Chili in Chester County!” — the site of the West Chester Rotary’s 16th Annual Chili Cookoff (Gay and High streets, Downtown West Chester, www.westchesterchilicookoff.com). All-you-can-eat wristbands are just $12. There will be more than 70 “Chili Teams” competing for the top prize in the following divisions — “People’s Choice,” “Business,” “Restaurant,” “Non-Profit” and “Hometown/Volunteer Cook.” Each team will prepare its best chili and submit a sample to a panel of local “celebrity” judges who name Best Chili in each category. The family-oriented event, which runs from 10:30 a.m.-3:30 p.m., will also feature a “Just 4 Kids” area on East Gay Street (with kids’ bounces, slides and other games), a variety of crafters who will be selling their goods, live entertainment and an array of food vendors. This weekend’s schedule features a pair of long-running fall festivals that have become area traditions – the Downingtown Friends Fall Festival and the Hay Creek Apple Festival. The Friends Fall Festival at the Downingtown Friends Meeting (Downingtown Friends Meeting, 800 E. Lancaster Ave., Downingtown, 610-269-4223,www.downingtownfriendsmeeting.org) is scheduled for October 13 from 9 a.m.-4 p.m.
One of the most popular fall festivals in the region, the Friends Fall Festival has been offering families a day of wholesome fun and value for more than 30 years. A special supervised area includes children’s crafts and games. There’s also a hay wagon ride and exceptional face painting for both kids and adults. Some of the free festival’s many attractions are plant, craft and white elephant sales, the Friends Mercantile for the sale of books, housewares, jewelry and children’s toys and the Quaker Heritage Exhibit, which features antique Quaker clothing and memorabilia. At 2 p.m. there will be a re-enactment of the first wedding held in the Meeting House in 1806. Visitors can attend the wedding inside the Meeting House and have photographs taken with the bride and groom and wedding party — all of whom will be dressed in authentically reproduced early 19th-century Quaker garb. The festival, which also offers free parking, will feature live folk and rock music along with demonstrations and community exhibits. There will also be a variety of tasty food items available for purchase. The Wooden Ladle will offer homemade vegetarian chili, hearty vegetable soup, juicy grilled hot dogs, funnel cake and hot apple cider, coffee, or cold drinks. The Wooden Ladle features such tasty item as homemade vegetarian chili, hearty vegetable soup, homemade macaroni and cheese, juicy grilled hot dogs, homemade pastries, pumpkin and apple pies, specialty teas, cakes and coffee. The Friends Mercantile, a not-to-be-missed stop for serious garage-sale shoppers, opens its doors at 9 a.m. and attracts a loyal following of shoppers with everything from fine gifts to children’s toys, books, housewares, jewelry, electronics, and more. The festival’s craft vendors offer everything from handcrafted needlework to woodcraft, leather, ceramics and more. 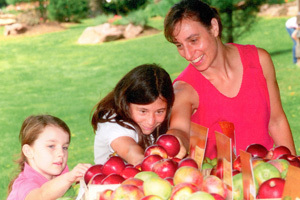 The Hay Creek Apple Festival (Historic Joanna Furnace, Route 10, Morgantown, 610-286-0388, www.haycreek.org), which also has been around for more than 30 years, is scheduled for October 13 and 14. The festival is a celebration of autumn and especially autumn’s favorite fruit — the apple — with a long list of special activities and an amazing variety of taste treats featuring apples. There will be more than 2,000 apple dumplings and over 800 apple pies ready for consumption this weekend at the festival. Also offered will be a variety of other treats such as fresh-pressed apple cider, apple waffles, apple crisp, Schnitz Un Knepp, apple fritters and the famous Hay Creek Apple Butter. The festival, which runs from 7 a.m.-5 p.m. on Saturday and from 7 a.m.-3 p.m. on Sunday, will also feature a flea market with over 100 stands. Visitors can shop for crafts, flowers, fall items, antiques and other items related to Berks County history. Hagley Museum and Library (Buck Road East entrance via Route 100, Wilmington, Delaware, 302-658-2400, www.hagley.org) has several special events scheduled for this weekend. “Hayrides at Hagley 2018” will be held on October 13 starting at the Visitor Center at 11 a.m. 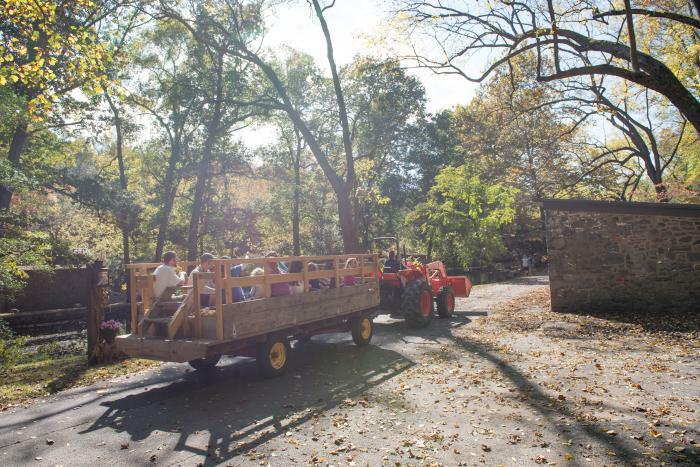 Visitors can take a hayride along the Brandywine Creek to experience the beautiful fall foliage in the Powder Yard. They will also be able to create fall-themed crafts, and get at up-close look at a gunpowder explosion, a roll mill in action, and working 19th-century machines. Hagley’s “Patent Model Tour’ will also be held on October 13. The event, which starts at 11 a.m. inside the Visitor Center, will feature one of Hagley’s guides narrating a tour of Hagley’s patent model collection. Participants will learn about the history of these fascinating miniature models of invention and the patent process that was established in 1790. The tour begins at the Visitor Center and is followed by a ride through the Powder Yards. Visitors will have a guided tour of Hagley’s current patent model display. Afterward, visitors will return to the Powder Yards where they may tour the rest of the museum on their own. The patent model tour lasts for approximately 1.5 hours. Another event on October 13 is “Science Saturday – Colorful Chromatography,” which will run from 1-4 p.m. in the Visitor Center. Participants can learn about pigments and diffusion and experiment with different tree leaves to discover their hidden colors using chromatography. 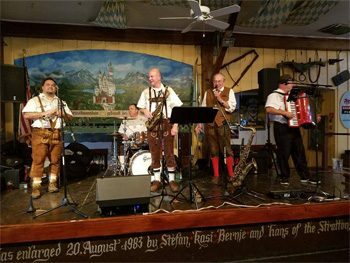 Stoudts Brewery (2800 North Reading Road, Adamstown, 717-484-4386, http://stoudts.com) is hosting “Oktoberfest with Mountain Express” on October 13 from 4-10 p.m. and “Oktoberfest with Alex Meixner Band” on October 14 from noon-6 p.m.
For those whose preference is wine rather than beer, there are several special events for you this weekend. Paradocx Vineyard (1833 Flint Hill Road, Landenberg, www.paradocx.com) will be hosting its annual “Harvest Festival and Family Fun Day” on October 13. There will also be an array of activities for the kids, including bounce houses and yard games. Paradocx’ “Harvets Fest and Family Fun Day,” which is free and open to the public, will run from 1-4 p.m.
On October 14, wine lovers will gather to help wage war against cancer at the 27th Annual Dilworthtown Inn Wine Festival (Dilworthtown Inn, 1390 Old Wilmington Pike, West Chester, 610-431-5329, http://www.chestercountyhospital.org/cchfdn.asp?p=1210). The event will get underway at noon and run until 4 p.m. — rain or shine. The festival features more than 100 wines, craft beers, hard cider along with delicious food prepared by Dilworthtown Inn chefs. There will also be a “Silent Auction,” shopping opportunities in the Gallery of Artisan Vendors, live music and a Craft Beer Area. The Dilworthtown Inn, and the Brandywine and Greystone branches of The Women’s Auxiliary to Chester County Hospital jointly organize this event. Proceeds from the wine festival benefit patients of The Cancer Program of Chester County Hospital and Neighborhood Hospice. Galer Estate Winery (700 Folly Hill Road, Kennett Square, 484-899-8013, www.galerestate.com) has a special activity slated for this weekend – “Wine & Chocolate Pairing.” The event will be held on October 14. Award-winning winemaker Virginia Mitchell and food writer Estelle Tracy will present a chocolate and wine pairing created specifically for Galer Estate Winery patrons. 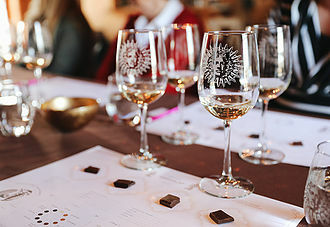 During this two-hour workshop, participants will learn wine and chocolate tasting basics, discover the secret behind successful pairings, and sample four wine and bean-to-bar chocolate pairings. All featured wines are made by Galer Estate Winery and will be available for purchase. The carefully-curated selection of chocolate includes award-winning American craft chocolate-makers. On October 13 and 14, the Ninth Annual Fall Wine Festival (Skippack Pike, Skippack, 610- 584-1155, http://winetober.com) will be held from 1-6 p.m. each day along the main street of the scenic village near the Skippack Creek in Montgomery County. The popular annual event, which is also known as Winetober Fest, will feature vendors with a tasty array of wine and food samples along with live music. Tickets for the event, which include food and wine sampling, are $25. One of Chester County’s most popular wineries will be participating in this weekend’s event — Paradocx Winery. And, there will even be a meadery – Haymaker Meadery. The list of participating wineries also includes Bee Kind Winery, Benignas Creek Vineyard and Winery, Juniata Valley Winery, Blue Mountain Vineyard and Cellars, Lopez Winery, Naylor Winery, Jay Zell Wines, Mountain Lake Winery and Renegade Winery. The Historic Odessa Foundation (Main Street, Odessa, Delaware, 302-378-4119, http://www.historicodessa.org) will present an event that is aimed at sending chills down your spine. The Delaware Shakespeare Festival will put audience members in a nicely-spooked state with a performance of “Shakespeare, Poe & Friends: A Night of Readings from the Dark Side.” On Oct. 12 starting at 7:30-9 p.m., actors will read seasonally spooky selections from the plays of Shakespeare and the poems and short stories of Edgar Allan Poe. The weird sisters of Macbeth will meet again, and the raven will certainly come knocking on the chamber door, but this year’s “Shakespeare/Poe” event will also offer readings that have not appeared in previous installments of this popular autumn show. The Historic Odessa Foundation offers tours to the public, families, groups and schools of its landmark Delaware properties — the Historic Houses of Odessa. The tour also provides a look at the foundation’s collection of more than 6,000 objects and furnishings that span an interpretive period in regional decorative arts from 1760-1850. The Historic Houses of Odessa are open to the public March through December, Tuesday through Saturday, 10 a.m.-4:30 p.m., and Sunday 1-4:30 p.m. General Admission is $10 for adults, $8 for seniors and students, and free for children (under six). Everywhere you look, there are pumpkins or pumpkin-related items have arrived and they’ve come in all shapes, sizes and forms – live pumpkins, carved pumpkins, illuminated plastic pumpkins, miniature pumpkins, pumpkin Oreos, huge pumpkins, white pumpkins, pumpkin lattes, artificial pumpkins and even digital pumpkins. If you look hard, you might even find pumpkin toothpaste. 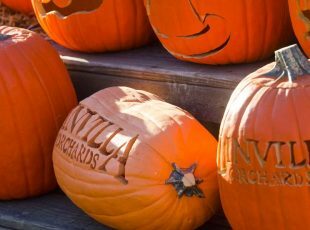 From October 18-20, “The Great Pumpkin Carve” (Chadds Ford Historical Society, Route 100, Chadds Ford, 610-388-7376, www.chaddsfordhistory.org) will return to its annual haunt. The popular event will start with the carving competition on October 18. Live entertainment, hayrides and hot food are featured all three days. Admission is $10 for adults (18 and older) and $5 for children (ages 7-17). A great way to enjoy autumn’s annual color display is to ride a special excursion on an area tourist railroad – and the West Chester Railroad has this covered too. The West Chester Railroad is running its special “Fall Foliage Express” trains on October 14 and November 3, 4, 10 and 11 with departures at noon and 2 p.m. The W&WRR also is running its “Hayride Express” on October 12 and November 2 and 9 at 7:30 p.m. each night. Visitors can experience a one-hour evening ride through the Red Clay Valley on an original railroad flatcar converted especially for hayrides. This weekend, the Greater Philadelphia Expo Center (100 Station Avenue, Oaks, 484-754-EXPO, http://www.phillyexpocenter.com) will host two very different events — Retro-Con and Minefaire. Both events will be held on October 14 and 15. “Retro Con: Retro Toy & Gaming Show” is a toy show that’s dedicated to all things retro. The event’s spotlight will shine on the toys from the 60’s, 70’s, 80’s and 90’s – and more. Retro Con is pop culture and memorabilia show catering to anything considered “retro” — especially the 80’s – things like Transformers, Star Wars, GI Joe, Ghostbusters, He-man, and classic video games. There will be more than 200 tables of collectibles and art for sale, as well as special guests, video games, a costume contest, raffles, a trivia contest, panels, replica props, and much more. The event will also have gaming systems set up – systems such as the classic NES & Saga — for fans to play. The show will run from 10 a.m.-6 p.m. on Saturday and 10 a.m.-4 p.m. on Sunday. Tickets are $20 on Saturday and $15 on Sunday. Minefaire is a convention of fans of the block-o-licious world of Minecraft, a game about placing blocks and going on adventures. Participants explore randomly-generated worlds and build amazing things from the simplest of homes to the grandest of castles. Visitors to Minefaire will be able to play in Creative Mode with unlimited resources or mine deep in Survival Mode, crafting weapons and armor to fend off dangerous mobs. Minefaire will run from 9 a.m.-5 p.m. on Saturday and Sunday. Admission is $29.50. The Philadelphia Comic-Con, which is scheduled to run from 10 a.m.-4 p.m. on October 14 at the Clarion Hotel Conference Center (76 Industrial Highway, Essington, 856-217-5737, www.philadelphiacomic-con.com), features comic books, trading cards and other collectibles — both modern and vintage. The event, which has an admission fee of $3, also features a number of special autograph guests. This Sunday, the guest artists are Darren Auck (Artist – Kubert Art School); Steve Myers, Jacob Jones-Goldstein, and Patrick Conlon (Creators – Oddity Prodigy Productions) and Hector Nazario (Artist). The popular collectibles event, which is the area’s longest running comic convention, will host dealers from all over the Northeast with sales booths featuring Gold & Silver Age comics, action figures, non-sport cards.